“If ever there was genocide – this is it!” declares Flavia Cherry, a St Lucian activist in Haiti representing Caribbean Feminist Network for Research and Action. 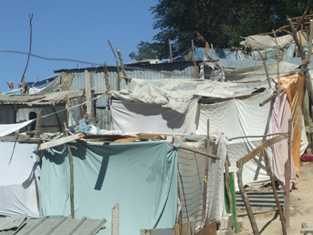 “People who are very sick are being left in camps, (consisting) only of bed sheets hung up by flimsy sticks, where no help is available,” she wrote in a dispatch to colleagues. 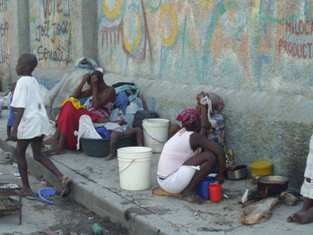 Haitian women and children huddle on the streets of Port-au-Prince - Flavia Cherry photo. Cherry and US-based Haitian lawyer/activist Marguerite Laurent paint a picture of desperation among impoverished people left even more destitute and many with injuries after the January 12 magnitude 7.8 earthquake demolished most of the capital Port-au-Prince, killing an estimated 100,000 people. Laurent and others are alleging a conspiracy to control the Haiti because of yet to be confirmed discoveries of huge oil and gas reserves on land and its territorial seas. “I interviewed 38 women and every single one of them was hungry,” said Cherry. “One lady … said that supplies were only distributed once, and since there was pushing and shoving, they never came back to her area. The only place for a desperately sick child (in the same picture) is for him to be slumped over a bucket, with the middle part of his body hanging into the bucket. She spoke of hearing that some French doctors amputating limbs when it was unnecessary, but this has not been confirmed. 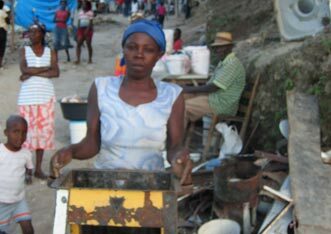 “Haitians are demonstrating because too many of them are left without food for extended periods,” she said but reported seeing people carrying American labeled bags of rice and other goods. Haitian women and children huddle on the streets of Port-au-Prince – Flavia Cherry photo. Haitian woman with makeshift grill collected from the rubble. Flavia Cherry photo. 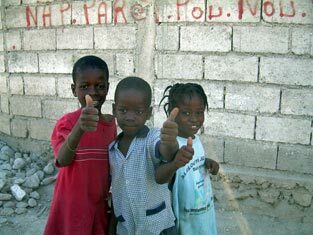 The US has assumed control of Haitian ports and manages the aid and distribution efforts. Cherry suggested that the Caribbean Community (CARICOM) integration group of which Haiti is a member could “make use of so many of us in the region who speak French and Creole” as it was clear that the international agencies cannot handle the scale of the problem. CARICOM’s initiative led by Jamaican military personnel was threatened with collapse last week until some members, principally the Bahamas, pledged money to keep the staff in place until March. Last weekend UNICEF’s executive director Ann Veneman, visited Port-au-Prince, and some of the makeshift shelters in open spaces in the city. UNICEF is delivering food, clean water and basic health services.